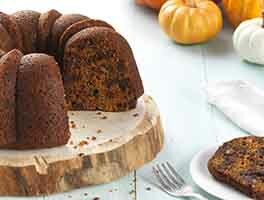 This pound cake — a rich dark brown outside, with a fine, golden crumb — is the perfect base for sliced fruit and a dollop of whipped cream. Preheat the oven to 325°F with a rack in the center position. Lightly grease a 9" x 5" loaf pan. Using an electric or stand mixer, beat together the butter and cream cheese at high speed until they're very light and fluffy. Add the salt, sugar, flour, and baking powder, and mix to combine; the batter will be stiff. Add the extracts and 1 egg. Beat well. Continue to add the eggs one at a time, beating well after each addition; the finished batter should be extremely light and fluffy. Bake the cake for 85 to 90 minutes, tenting it lightly with aluminum foil after 60 minutes, until a toothpick inserted into the center comes out clean. Remove the cake from the oven, and after 5 minutes turn it out of the pan to cool on a rack. 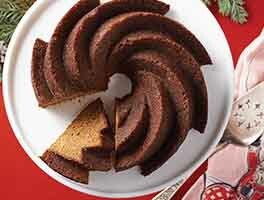 Serve the cake warm or at room temperature; dust it lightly with confectioners' sugar just before slicing, if desired. 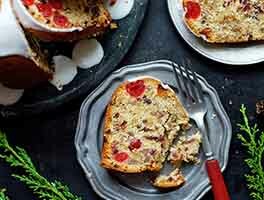 Store the cake, well-wrapped, at room temperature for several days; freeze for longer storage. I baked this for Dessert for easter dinner. Due to nut allergies, I replaced the almond extract with more vanilla. Everyone raved over the cake. This recipe is a keeper. I read the reviews before I baked, and since my loaf pan was smaller than 9 x 5, I set aside about 6 oz of batter for cupcakes. I also baked the loaf for only 75 minutes, by which time the toothpick inserted into the center was coming out completely clean. While the flavor and texture of the top part of the loaf were lovely, the cake collapsed after I took it out of the oven and it was dense at the bottom. I cannot determine if underbeating or overbeating was the cause of this, or if there was some other cause. We decided to celebrate the first strawberries of the year by baking this pound cake! I followed the directions exactly and it is so delicious. The cake perfectly compliments the fresh strawberries, and whipped cream just takes it to a whole different level. This will now be our traditional pound cake for the first strawberries of the year. Followed the recipe exactly - fluffy batter made a beautiful pound cake with fine, moist texture. Took the full 90 minutes to cook through. I can't wait to make it again! 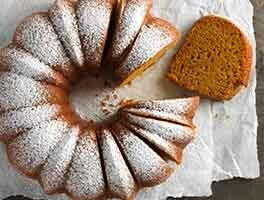 This is a very delicious pound cake. I substituted the almond extract for lemon extract. I baked it in a dark metal, nonstick loaf pan and baked the cake at 300 degrees instead of 325 degrees. The sides still browned too quickly and top hardened. I think the next time I will bake it in a glass or light metal pan. I didn't have a problem with using a 9x5 inch pan. 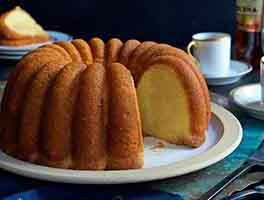 Thi add will be my go too recipe when I want a smaller pound cake that is super easy to make. I am looking for a good recipe for a traditional Easter lamb cake was wondering if this might be a possibility. 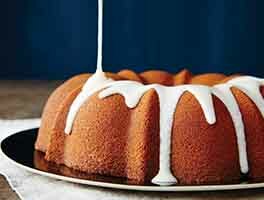 I usually use a boxed cake mix but would like to try to make one from scratch. I use a Molded Lamb Cake Pan and fill the bottom half. The other half of the mold does not get filled but is placed on top and weighted down. As the cake rises, it fills in the top half so the result is a lovely Easter Lamb. Would this recipe work? Also, is there a way of converting this recipe into a chocolate version? Hope you could help me! Hi Teri! We haven't tested this cake for molds but if you're down for a little experimentation, go for it! We'd highly recommend doing a test run before making the actual cake for Easter to see if it performs the way you want it to. Easy recipe and excellent results. I added lemon zest and substituted lemon flavoring for the almond. It was a lot of batter, would recommend a larger baking pan. Turned out amazing and I keep getting requests for more. Very good recipe. Easy to make. My 9" x 5" bread pan worked fine. To verify you have the correct size bread pan, it should hold just under 7 cups of water. Warning! Normal 9"x 5" loaf pan overflowed, making a serious mess. Weigh the ingredients, and if it seems there is to much batter for your pan, THERE IS! Use the extra for a cupcake or something, just be sure there is plenty of room for it to rise. It's possible I over beat the batter, winding up with too much volume, but I wouldn't change because the final product tasted EXCELLENT, and the texture was perfect.